Joan Wages, President and CEO of the National Women’s History Museum will lead us in a dynamic, multi-faceted conversation exploring the lack of women in our national narrative and the challenges, and ever evolving assortment of issues girls and women face as a result. Join this webinar and be inspired as Joan introduces us to several highly accomplished women in history you’ve likely not heard of and the impact these women have had on the world. You will hear about the impact a womanless history has on girls’ self-esteem and career choices, as well as its impact on young boys, men and society as a whole. You will also learn about Joan’s dedication to raising public awareness of and celebrating the diverse historic contributions of women and her nearly 20 year crusade to build a national women’s history museum at the National Mall in Washington, D.C.
As president & CEO of the National Women's History Museum, Joan Bradley Wages leads the 501(c)(3) nonprofit organization dedicated to educating the general public about the diverse historic contributions of women and raising awareness about the critical need for a national women's history museum in our nation's capital. As one of NWHM's founding board members, Joan has been a passionate and tireless champion of this effort for nearly 20 years. In addition to overseeing the Museum's Development, Programming, Events, Communications, and External Affairs efforts, she has been lobbying Congress to pass current legislation which would establish a bi-partisan Congressional Commission to produce a feasible plan for the Museum including its governance, organizational structure, fundraising, location and operations. Joan has championed women's issues on and off Capitol Hill throughout her career. As a registered lobbyist, she worked with legislators and women's organizations to effect positive change on a host of issues. It was therefore no surprise when she teamed with a small group of women to advocate for the transfer of The Portrait Monument (a 7-ton statue depicting the founders of the U.S. suffrage movement) from the Capitol Crypt to the Rotunda, where it stands today. Joan was instrumental in the development and passage of the legislation, as well as in raising the funds to cover the cost of the move. The project was expected to be short term and Joan scoffed at the suggestion that the next project was to build a National Women's History Museum on the Mall. That was in 1996 and she's never looked back. 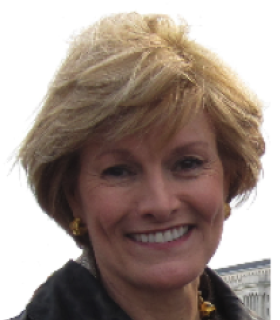 Prior to joining NWHM, Joan served as president of Cash, Smith & Wages, a government affairs consulting firm. With proven expertise in state and federal legislation, national grassroots lobbying campaigns, lobbying federal agencies to influence the regulatory process, and political campaigns, Ms. Wages' legislative accomplishments include passage of the Family and Medical Leave Act, as well as the smoking ban on aircraft, numerous aviation security measures, and Delaware legislation to prevent the take-over of corporations by corporate raiders. Joan began her career in the airline industry as a flight attendant for Trans World Airlines. She went on to serve as director of Customer Service for the airline and eventually joined the Independent Federation of Flight Attendants as its spokesperson and lobbyist. As a political action committee (PAC) director, Joan had frequent contact with members of Congress. She has participated in numerous professional and political organizations including Women in Government Relations and the Women's Leadership Forum and served on the Board of the Virginia Alliance for Health Care Freedom. As a result of her efforts on behalf of the Museum, Joan was honored by Lifetime Television as part of its Remarkable Women series. Ms. Wages holds a B.A. from Auburn University and an M.A. in Philosophy from Columbia Pacific University.